General: Tours from our kennel at the base of Purgatory Ski Area Friday-Monday.Great for the whole family. Two sleds are available per hour(a third can be added upon request.Advanced booking recommended. Same day trips available. The Dog Sled: Price of $195 is per sled.Two people or #375 fit comfortably on the sled with a guide. If under #375 we can add a smaller person or child for an additional fee of $55 (not to exceed weight limit, please). Meeting Place: Hourly Tours meet at Purgatory Guest Services in the Plaza, #1 Skier Place (unless snow conditions dictate otherwise).Check in with Guest Services,our complimentary shuttle will bring you to our Purgatory kennel. Timing: Tours last approximately an hour, depending on snow conditions. 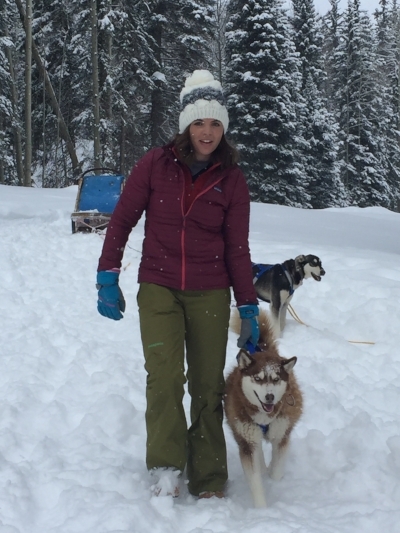 You will get a mushing lesson before getting on the sled, and you will finish with a hot chocolate after mingling with your dogs and giving them treats. A shuttle will return you to the meeting place. Booking: Book using our online reservation system. If you have questions, please call (970)259-0694. For large groups of 8 more or other customization, call Gretchen at (970)259-0694. Trips are non-refundable and reserved just for you! General: Half day tours are an excellent adventure for those who want to drive a dogsled through the San Juan Mountains. Two sleds go out per day at 9am, returning between 1-2pm. This is an exclusive and intimate trip through the forest.Advanced reservations are required. Trips are non-refundable and go in all conditions. The Dog Sled: Price of $400 is per sled.Two people or #375 fit comfortably on the sled with a guide. If under #375 we can add a smaller person or child for an additional fee of $75 (not to exceed weight limit, please). Meeting Place: You will need your own transportation. We will meet you at a designated meeting place in Mancos,Colorado , a less than thirty minute drive from downtown Durango on a major highway.We will call the evening of the trip to confirm meeting time and place and go over directions and last minute details. Timing: Tours last approximately 3-4 hours. The trip includes a mushing lesson and all participants will harness the dogs, drive the sled and return to the trailhead for a light picnic. Booking: Click on the link below to book using our online reservation system. If you have additional questions, please call (970)259-0694 and we'd be happy to help. Trips are non-refundable and reserved just for you!